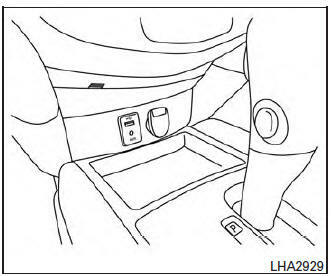 The USB connection port is located on the center console beneath the heater and air conditioner controls. Insert the USB device into the connection port. Place the ignition switch in the ON or ACC position and press the MEDIA button to switch to the USB input mode. If a CD is playing or another audio source is plugged in through the AUX IN jack located in the center console, the MEDIA button toggles between the three sources. Press and hold the or SEEK•CAT/TRACK buttons for 1.5 seconds while an audio file on the USB device is playing to reverse or fast forward the track being played. The track plays at an increased speed while reversing or fast forwarding. When the button is released, the audio file returns to normal play speed. Press the SEEK/CAT button while an audio file on the USB device is playing to return to the beginning of the current track. Press the SEEK/CAT button several times to skip backward several tracks. Press the TRACK button while an audio file on the USB device is playing to advance one track. Press the TRACK button several times to skip forward several tracks. If the last track in a folder on the USB device is skipped, the first track of the next folder is played. If there are multiple folders with audio files on the USB device, turn the TUNE/SCROLL knob to change folders. Turn the knob to the left to skip back a folder. Turn the knob to the right to skip ahead a folder. If there is only one folder of audio files on the USB device, turning the TUNE/SCROLL knob in either direction will return to the first track on the USB device.